The VM700T Option 40 Audio Measurement Set expands the power of the VM700T Option 01 NTSC or Option 11 PAL Video Measurement Set to include comprehensive audio measurement capabilities. This option incorporates both automated and manual audio measurements, audio spectral analysis, multitone analysis and stereo audio monitoring into the VM700T's full set of video measurements. There are a total of 4 multitone signals available. With this module, the VM700T can continuously monitor your audio lines for the presence of a test sequence designed for automated testing. The sequence of test tones begins with a one second FSK signal which identifies the source of the test signals, indicates which stored measurement program is to be used and instructs the VM700T to begin measurements. The remainder of the sequence consists of a number of test tones at defined levels and frequencies, each tone typically being one second in duration. This sequence is inserted in the audio line by the Tektronix ASG100 or other device capable of creating a compatible sequence. 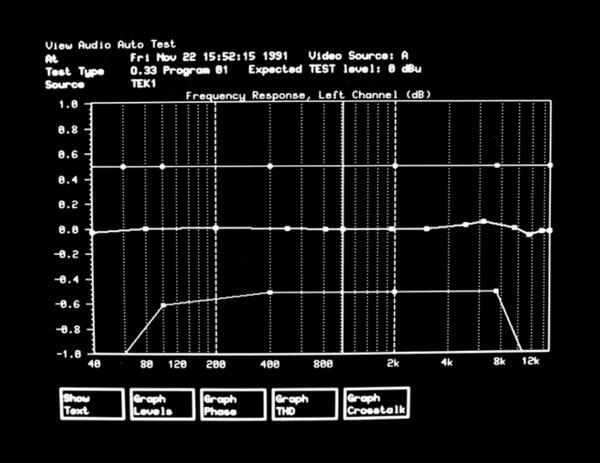 Auto test - Frequency response plot for program sequence 01. 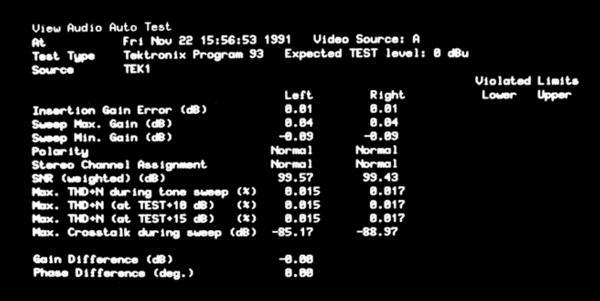 Auto test - Tabular results for program sequence 93. 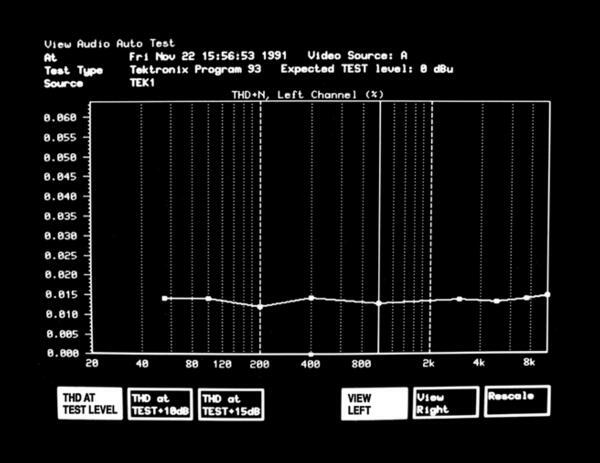 Auto test - THD vs. frequency plot for program sequence 93. 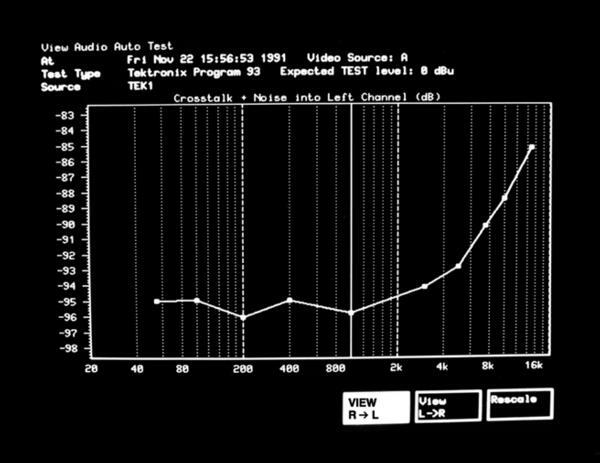 Auto test - Crosstalk and noise into left channel for TEK93 program sequence. Multitone analyzer - Frequency response. 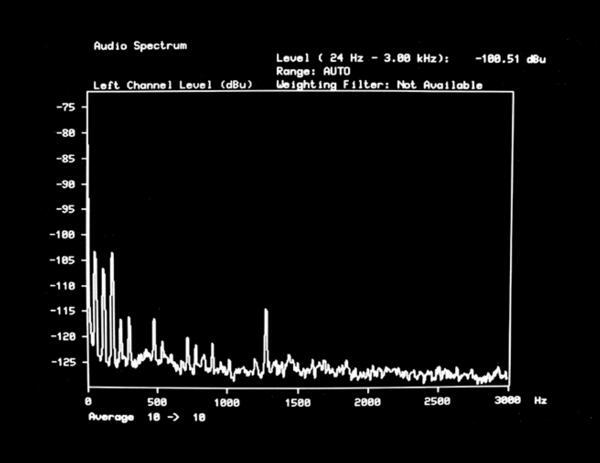 Audio spectrum - High resolution mode. Audio spectrum - Full spectrum mode. 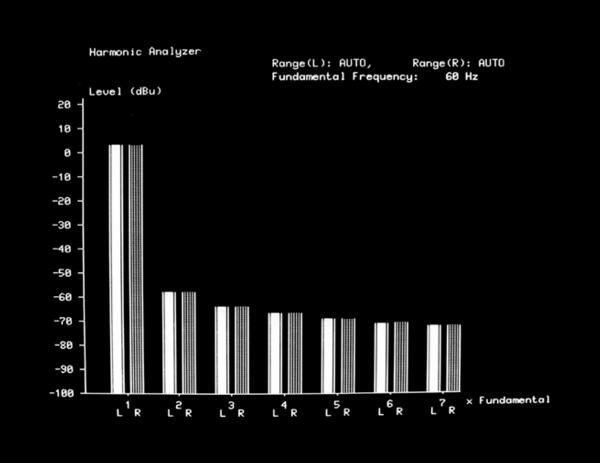 Audio spectrum - View harmonics mode. Multitone analyzer - Level and phase difference vs. frequency. Testing to the ANSI standard T1.502-1988, EIA/TIA-250-C or CCITT 0.33 is accomplished through stored measurement programs. The CCITT 0.33 recommendation specifies tone sequence parameters necessary for rapidly measuring stereophonic pairs and monaural sound program circuits, links and connections. FSK tones unique to each sequence type prompt the Option 40 Audio Measurement Set to perform the appropriate measurement. Audio measurement results obtained via automatic monitoring can be included in the VM700T's Auto mode video measurements display with the time and date of the last sequence received. Timed reports and logging of results outside user defined limits can be done automatically. Additionally, a file in the VM700T's Measurement Results directory is updated each time a sequence is received and measured. In addition to automated measurements, this option provides real-time displays of audio parameters. A dual-channel audio spectral display of frequencies from 10 Hz to 20 kHz is derived from a real-time FFT. A cursor allows direct signal level measurements at desired frequencies. 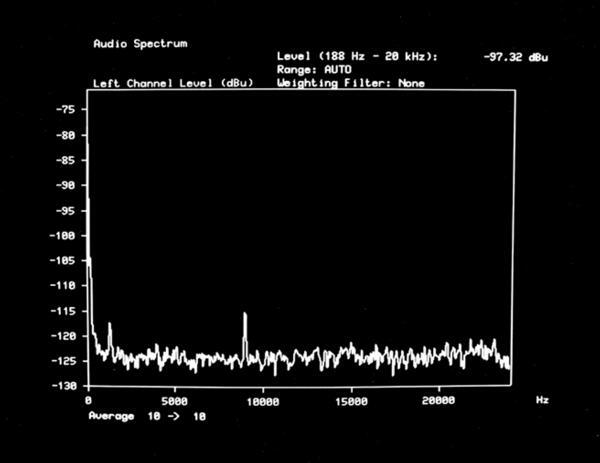 A high resolution mode allows more detailed analysis of any 3 kHz section of the spectrum. The "View Harmonics" mode can be used to look for harmonics of the power line frequency or any user defined frequency. This is very useful for tracing hum problems. Multitone analyzer - Distortion + noise. 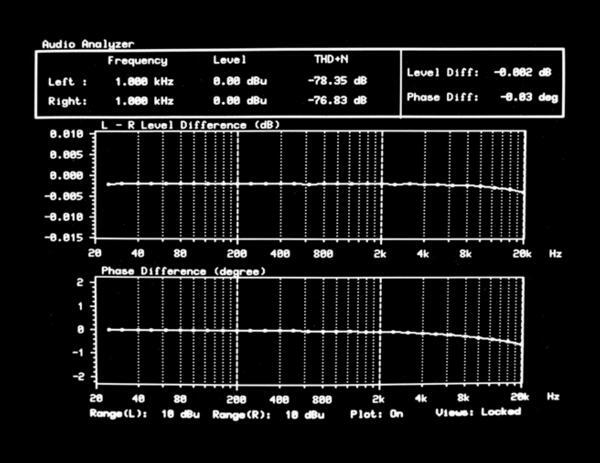 Audio analyzer - THD vs. frequency. 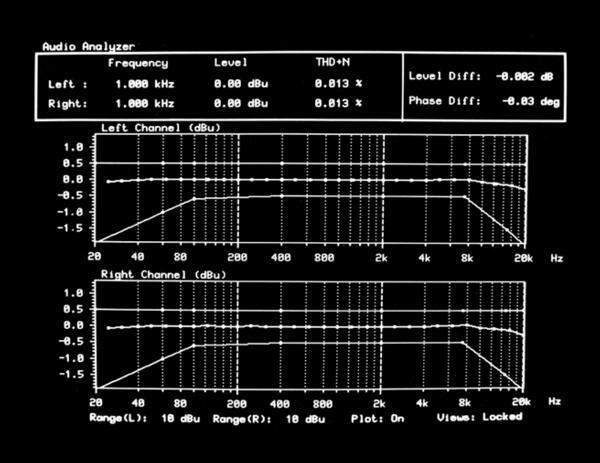 Audio analyzer - Level and phase difference vs. frequency. Audio analyzer - Frequency response. 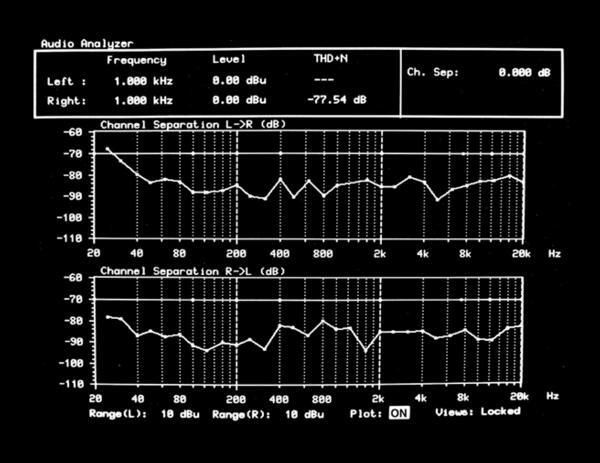 Audio analyzer - Channel separation. 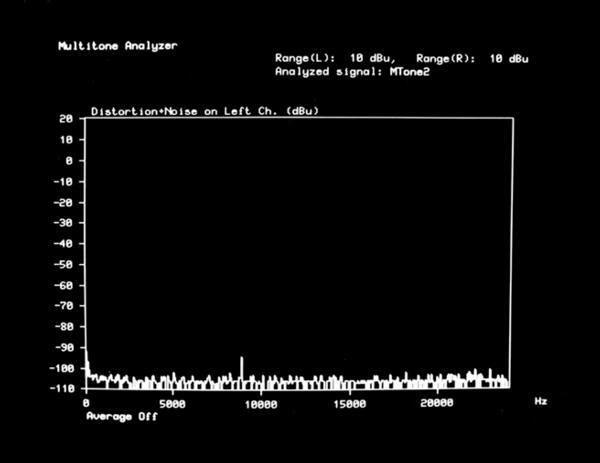 The multitone analyzer mode measures a test signal consisting of sinewaves at several frequencies generated simultaneously. The phases of these frequencies are chosen such that the overall crest factor is minimized. The measurement is only compatible with multitone signals from the ASG100. The VM700T automatically recognizes which of these four signals it is receiving. From the received multitone signal, this mode produces real-time displays of frequency response, crosstalk, phase and distortion plus noise. This is useful when only a few seconds are available to perform a complete measurement or for adjusting a processing device or nulling out a distortion. 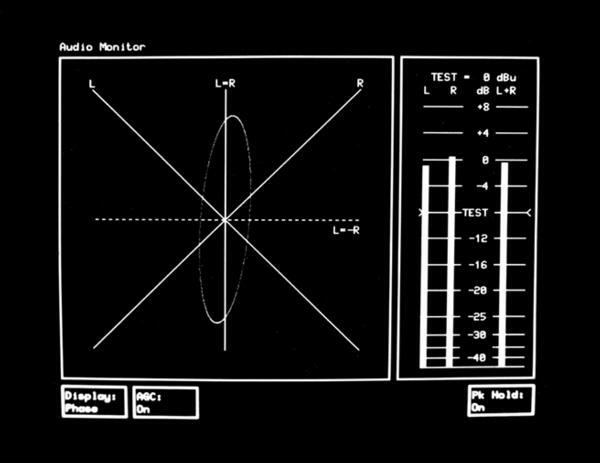 A software implementation of the Tektronix 760 Stereo Audio monitor is also built into the Option 40 Audio Measurement Set. This display offers valuable information in both monitoring and setup roles through its graphic portrayal of the stereo audio signal. Bar graphs of the left and right channels accompany the stereo audio display. These graphs can utilize the Nordic, DIN or PPM scales available for the 760, or a VU scale. The audio analyzer mode displays in real-time the frequency, level and THD + N for each channel. The level and phase difference between channels are also displayed. Additionally, this mode can display a graph of level versus frequency, THD + N versus frequency, crosstalk and phase in response to an incoming sweep. Unlike Option 40, Option 41 allows specification of an individual audio channel (1, 2 or 3) to a video source (A, B or C). Selection of the three audio channels then follows selection of the video source from the VM700T keypad. Option 41 Audio Connector on VM700T Rear Panel. The VM700T with Option 41 utilizes a male DB-37 connector located on the instrument back panel for signal input as opposed to the mini-XLRs used by Option 40. This allows input of up to 3 balanced line stereo pairs. Operation of Option 41 is similar to Option 40. Multitone, Audio Analyzer, Audio Spectrum Analyzer, Audio Monitor and View Audio Auto Test all work the same under Option 41. The only difference is that the audio channel to be measured is specified in the Source Selection Audio File. Because the audio source selection is internal to the VM700T, Option 41 is ideal for measuring outputs from devices with more than 1 audio pair out, such as production VCRs and audio distribution amplifiers. Range (for specified accuracy) - 69 dBu to 26.5 dBu (275 µV to 16.4 VRMS). ±0.2 dB (input -20 dBu). ±0.3 dB (-50 dBu to -20 dBu). ±0.5 dB (-60 dBu to -50 dBu). ±1.0 dB (-70 dBu to -60 dBu). Flatness - ±0.1 dB from 20 Hz to 20 kHz. 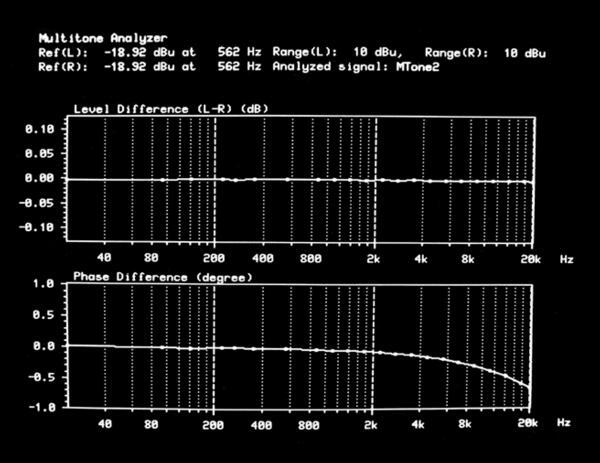 Range - 10 Hz to 20 kHz. Range - ≤0.01% to 33%. 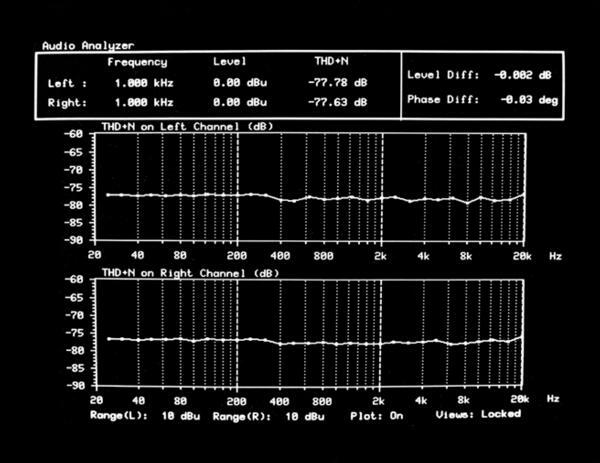 Residual THD+N - ≤0.01% (≤-80 dB) measured over a 20 kHz bandwidth, for inputs from 10 Hz to 10 kHz above -13.5 dBu. Minimum Multitone Recognition Time - 1 second. Measurement Update Rate - 5 readings per second. Maximum Frequency Error for Multitone Recognition - Within ± 10% of reference frequency. Level and Frequency Measurement Accuracy - Same as audio analyzer. Input Connectors - Opt. 40: Two miniature XLR (Switchcraft TY3F). Opt. 41: One male DB-37. Input Impedance - 50 kilohm (differential). For inputs ≥-18 dBu (100 mV) s/n ≥82 dB1. For inputs ≥0 dBu (775 mV) s/n ≥98 dB1. For inputs ≥+8 dBu (2 V) s/n ≥106 dB1. 1 "A" weighting improves s/n by approximately 2.5 dB. Level Difference Between Channels - ≤0.5 dB. Phase Difference Between Channels - ≤2°. Phase Measurement Error - ≤2°. 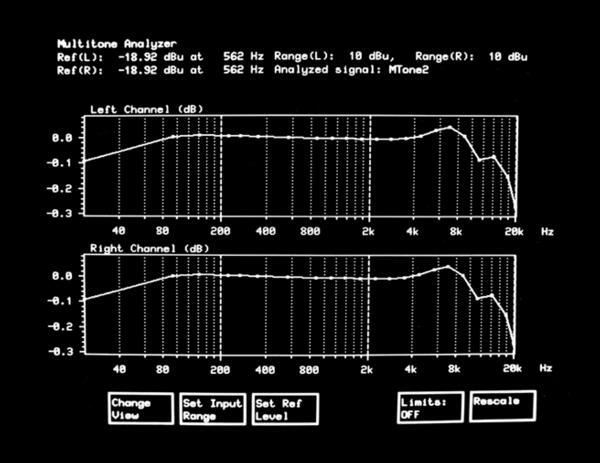 <70 dB to 60 Hz (due to DC offset effects). ≥95 dB from 60 Hz to 20 kHz.